The grapes are selected from top growers in Stellenbosch. A combination of soil, climate, clones and vine age determine the vineyard blocks selected. With meticulous viticulture and a focus on canopy microclimate and soil health, we try to ensure that each vineyard can express itself to its full extent. Vineyard blocks are vinified separately to determine their quality and style, ensuring that their unique character is understood and shown. Within Stellenbosch, the majority of the fruit comes from two soil types – decomposed granite soils higher on the mountain slopes and sandy gravel on the valley floor. Most of our vineyards are close to the ocean, providing a cooling breeze in the afternoon during the hot summer months. These vineyards are also on sandy gravel soils that warm up fast during budding and provide us with earlier ripening grapes. The decomposed granite soils are mainly higher on the mountain slopes where the altitude helps to cool the vineyards. These soils bud and ripen later in the season. Other soils include decomposed shale and the warmer slopes of the Bottelary Hills. The basic vinification involves the use of open top fermenters and manual punch downs under controlled fermentation temperatures. The berries are sorted after de-stemming and then go to open, lined concrete fermenters where inoculation with yeast takes place. Fermentation on the skins follows with regular manual punch-downs to ensure maximum color, tannin and flavor extraction. The wines were fermented separately until dry in traditional open concrete tanks with regular manual plunging. Secondary fermentation proceeded in tanks after which the wines were moved to French oak barrels for 12 months. Blended after a year of aging and matured for a further 8 months in barrel. No fining. Le Riche Wines is situated on the slopes of the Helderberg Mountain, in close proximity to the historic town of Stellenbosch. 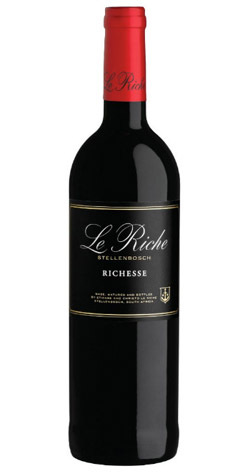 Le Riche Wines was founded by Etienne le Riche in 1996 and is now run as a family concern. Coming from an illustrious career in the South African wine industry, Etienne decided to create a winery where he could express the cultivar he had grown to love and respect, Cabernet Sauvignon. The approach was simple, to illustrate the nuances of Stellenbosch Cabernets as best possible. Preferring not to be inhibited by estate classification, he chose to select grapes from the best possible terroirs Stellenbosch had to offer. The resulting wines have shown great elegance and class, consistently proving to be of superb quality and maturation potential.